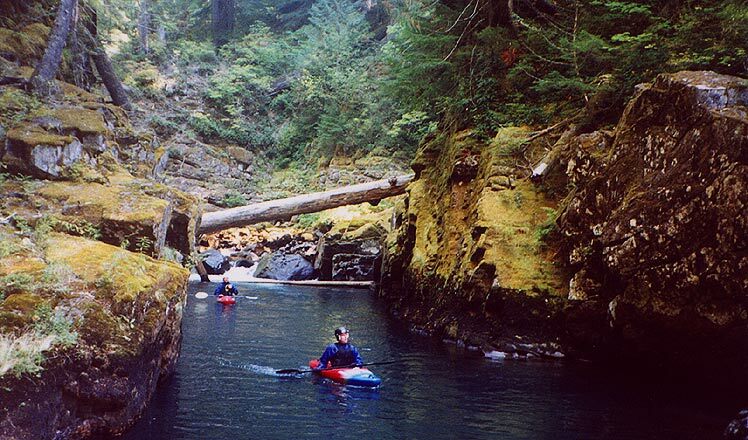 The Ohanepecosh (pronounced Oh-Hanee-pekosh) River is a Northwest Classic. 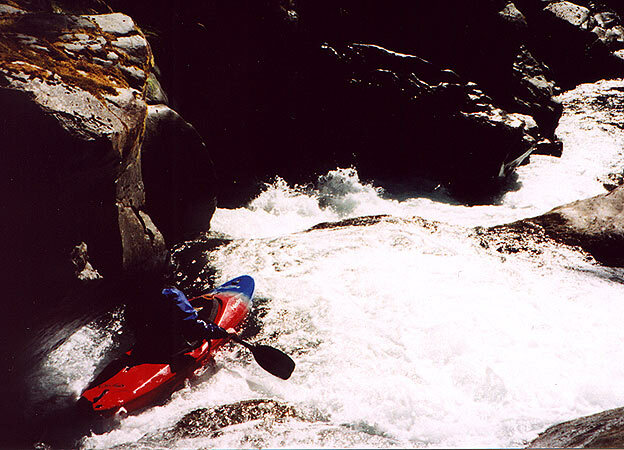 This run has it all: huge, burly boulder-chokers, ledges, falls, and plenty of other rapids in between the big stuff to keep you on your toes. This river is spectacularly (and famously) beautiful; your first run through this gorge is an experience you will never forget. Josh Knapp, hiking down to the put-in for the Ohane. Below the put-in the river stays busy with lots of fun class III boulder gardens adjacent to Ohanepecosh Campground. Soon the river pools up and the rock walls begin to rise out of the water as the river coils into itself and gets ready to explode downstream. 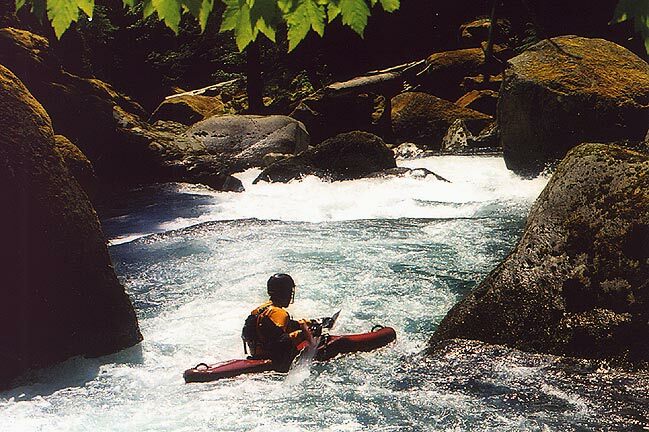 The scenery is great by the campgrounds but you haven't seen anything yet; like the whitewater the scenery only gets better as you head downstream! 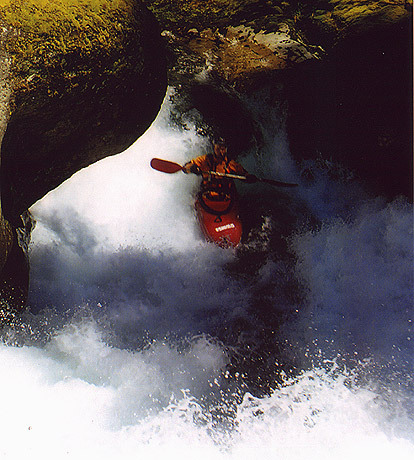 Marc Strabic and Pete Giordano enter the gorge below the relatively easy warm-up rapids. The first major drop is a beefy boulder-choked romper-stomper that is usually portaged on the right. 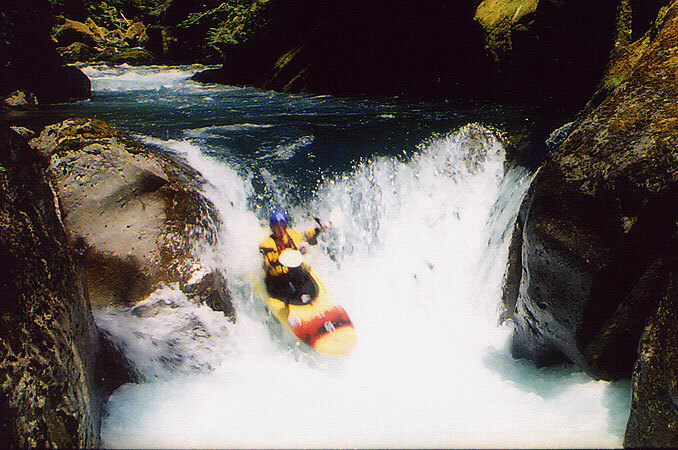 I'll tell you right now the photo below actually makes this rapid look somewhat runnable, but when you see it in person you will probably change your mind in a hurry! 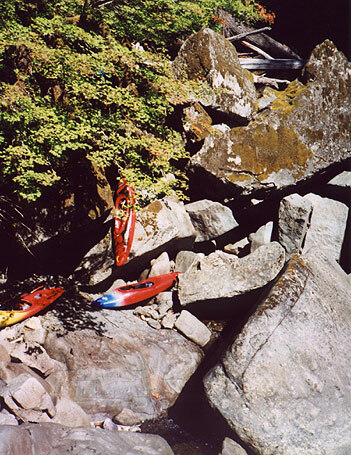 Soon the river tilts on edge and the river enters the first in a long series of precipitous boulder gardens that are guaranteed to please even the most well-traveled paddlers. I'll never forget my first time in this canyon; it seemed like every time we got out to scout there was another big horizon line downstream with no end in sight.. 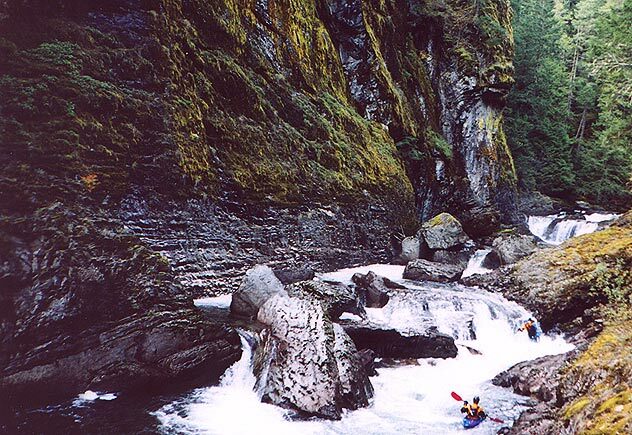 The gorge on this run is wonderfully scenic, with deep green pools between each riotous drop and soaring rock walls. This river rivals the Clear Fork in terms of scenery, and it a few places it is simply spectacular. Looks like... right down the middle! Marc Strabic eddy-hopping down yet another fun drop in the Ohane Gorge. We had planned a trip up to this area of Washington for some time, but some of us wanted to get an early start, so Josh Knapp and I headed up to the Ohanepecosh on Thursday, June 28th. Upon arriving we snagged a choice campsite at the free Secret Camp (if I told you it wouldn't be a secret) on the banks of the Ohanepecosh and bunked down with the mice for the night. They proved to be rambunctious companions and eventually drove Josh from the back of his truck sometime in the middle of the night. The next morning we got our first look at the river (perhaps flowing with 700-800 cfs) and drove into Rainier National Park to reach the put-in at Ohanepecosh campground. We were both a bit nervous. 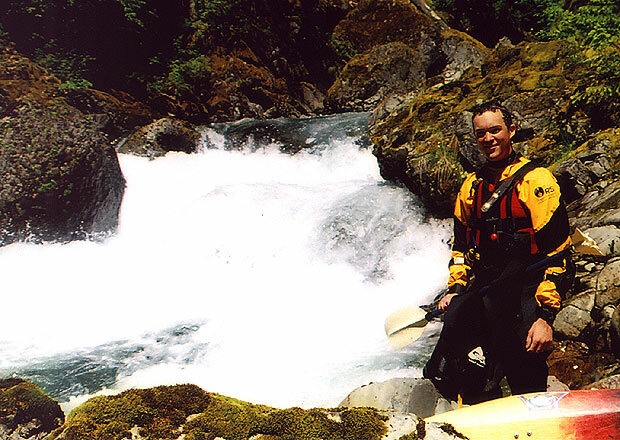 I had done the river once, but only with about 250 cfs, and it was Josh's maiden voyage. I had a good idea just how pushy the rapids were going to be; especially for my tiny Topolino. After the first big drop (that we portaged on the right), the river settles into a steady rhythm of drops in the 4-8 foot range that thread between huge boulders, and large slow-moving pools. Many of the monster boulders are undercut, so be wary! We rounded one corner to see what looked like a waterfall in front of us. The river was slack up to a line of boulders, and then it was gone. Upon scouting, we found the right side was a 15 foot falls over a line of boulders, and the left was a steep slide. The runout was another large boulder garden that continued to drop away. We chose the slide, screamed into an eddy above the boulder garden, and then picked our way through. Steve runs the slide. 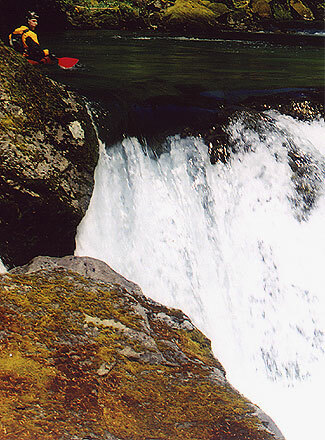 The water is hitting a submerged rock at the bottom of this drop, but the current is going so fast you will either miss it or bounce past it if you keep your boat straight. We were now alongside the Secret Camp. 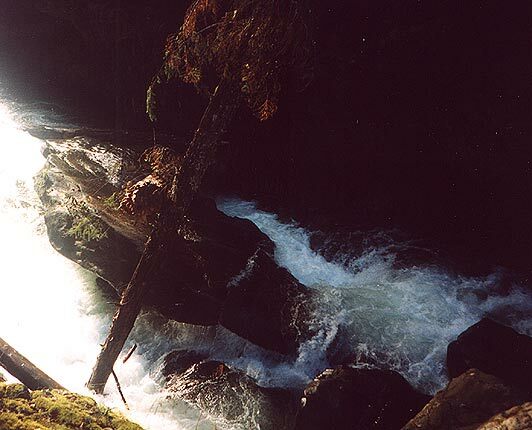 One of the drops was backed up by a large boulder that had water flowing over it in surging waves. The upstream side was a big hole. We both punched the hole and tried to ride over the boulder. A surge stalled me out and I got squirted and flipped through a slot on the right of the boulder. While flipping I hit the side of my head about as hard as I ever have. Thank God for a full coverage, hockey-style helmet. It snapped my neck hard, but otherwise no damage was done. Just below this rapid is a narrow ledge that drops into a sticky hole with a small cave/crack on the left side of the hole. I opted to portage this along the submerged ledge in the right wall. Later, I ran it, missed my line by a bit and ended up fighting hard to stay out of that cave. It would be a bad place to swim. Josh Knapp runs the ledge with the crack/cave combo visible in the left wall. After this ledge, the river mellows to class II-III for a quarter mile or so. Then there is a drop with a log wedged across it. You can rail-slide over the log, but beware the hole below. If you want to see someone getting worked here, there is a video out there with Shannon Carroll getting missing a spin and getting stuffed under the log (note: it is fairly high water in that video sequence). Scout on the left. Below this drop the river stays mellow for a bit, then a large triple drop will greet you. The first drop in the triple is pretty trashy. I like to grunt my way over the portage on the right. It's not too bad, and if it saves me broken gear then it is worth it. Josh ran this, and ended up flipping and breaking his Lightning (note: this was his first broken paddle in 6 years, he leads a charmed life for a creeker). I watched as he rolled, realized what had happened, and came to grips with having to C-1 the next class V drop he was at the lip of. He made it through without flipping, and managed to make it to shore just before the lip of the final drop. Then he had to try and hang onto the rocks, his paddle remnants, and his boat, while getting out of the river. I watched from atop the portage route, and once he was secure I finished portaging that first drop and ran the next two. I got worked pretty hard in the final drop as my Topo squirted its way along the right wall. Josh Knapp, broken paddle in hand. He ran the drop in the background C1 style, with only one blade, and managed to catch the eddy before the next drop! NICE! Now we had the pleasure of hiking out of the Ohanepecosh. I had a breakdown paddle, but it had been too large to fit in the Topo and the Y. Fortunately the gorge is only about 50 feet deep and the road was about 15 minutes away. It wasn't a big deal to hike out. It turns out we were just above the confluence with Summit Creek and had completed most of the big rapids. Steve and company returned two days later to finish the run after paddling the Clear Fork, and everyone had a good time. Below where Steve and Josh hiked out the rapids cool off a bit until you get to a river-wide, eight foot ledge that is really sweet. Steve scopes out a line on the return trip. 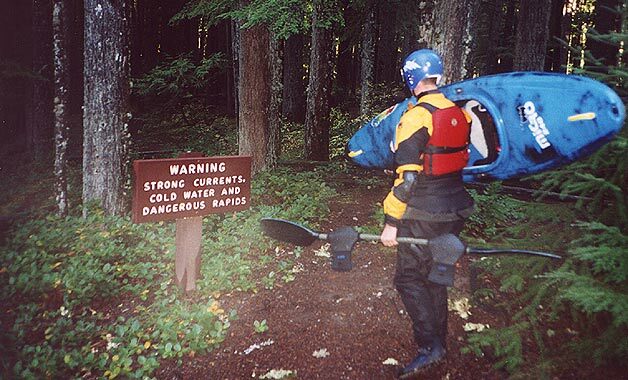 One of the last major drops on the Ohane is Elbow Room, a positively evil V+ rapid that is a mandatory portage now that the left side is full of wood. It used to be that you could run this rapid, but those days are over until the wood clears out. If you are running this river for the first time and don't have anyone along who is familiar with it, be extremely careful as you approach this rapid. This drop is about two-thirds of the way though the run and is just downstream from a uniform, river-wide eight foot ledge. Below the ledge the walls rise to unprecedented heights; eddy out on the left and get ready to portage. 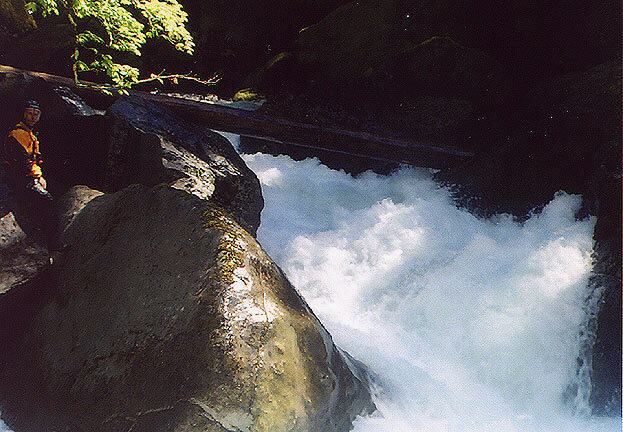 At Elbow Room the river cascades down through a steep bouldery drop, ending at a huge boulder that divides the flow. At the boulder about half of the water goes to the right where it dives under a huge flat rock that has fallen into the river from the cliffs above. This rock is especially deadly because it is resting on top of a pile of smaller boulders, forming a nearly uniform sieve that will give you the chills just looking at it. Looking down into the final (crux) drop at Elbow Room. The large flat rock in the middle of the river is resting on top of smaller boulders, forming a deadly boulder sieve. Most folks used to run left, but the wood in there forces most to portage these days. Both sides of Elbow Room have been run (many times), but I will never run this drop. Personally, I think the best line at Elbow Room is to climb up the narrow trail on the left side cliff and follow it downstream a couple of hundred yards to where an obvious trail drops back down to the river. Alternatively, you can climb up onto a narrow rocky catwalk on river right and ease your boats across, with Elbow Room roaring sixty feet below. If you don't mind a little exposure, this route cuts the portage in half. Below here are some of the biggest drops and most spectacular scenery on the Ohane. Steve Stuckmeyer watches from an eddy as Josh Knapp runs some of the last big stuff on the Ohahe. Below the last of the rapids be sure to take note of the ancient Indian fishing holes you're floating over, and the flow on the Clear Fork immediately above where you take out. If the Clear Fork has more than 250 cfs, you might want to run it now that you're warmed up!! It might not be as gorgeous as the Ohanepecosh, but it sure has a LOT more action! Flows: The Cispus @ Randle peak readings were 1050, 950, and 900 cfs on the three days of this trip. The Cowlitz @ Packwood was reading 2000, 1600, and 1500 cfs. The first and last days were on the Ohanepecosh. I think it would have been flowing with about 800 and then 600 cfs when we did it. A parting shot... Roping the boats around a nasty one on the Ohane.